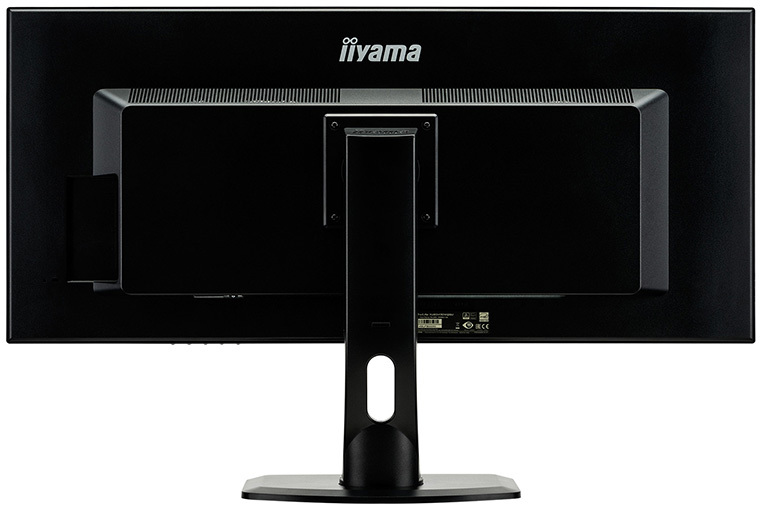 iiyama is a monitor manufacturer that enthusiasts usually remember with fondness. Back in the day, when yours truly thought he was the bee's knees at Quake II, the iiyama Vision Master Pro 17 was the monitor to own and fawn over. , equipped with an onerous name but, more importantly, a 3,440x1,440 resolution inside a 34in panel. Basic 34in widescreens ship with a 2,560x1,080 resolution and cost from £375. 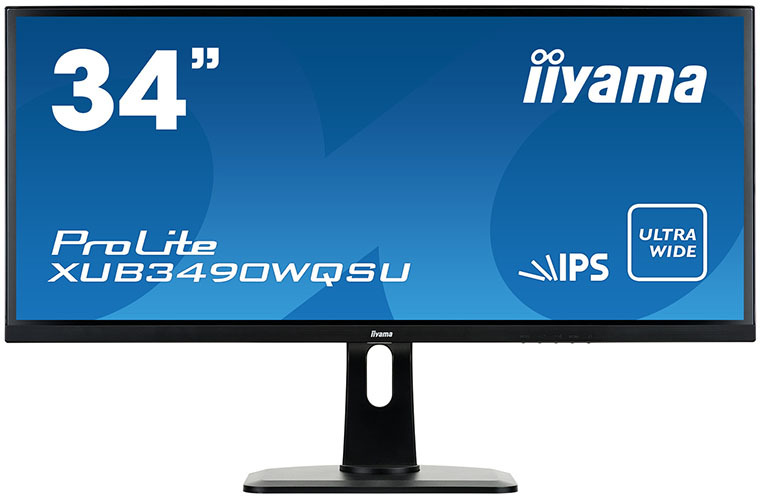 Others, like this iiyama, are more geared for productivity and use higher-resolution, 3,440x1,440-pixel AH-IPS panels. These monitors typically cost £500, with the high price a reflection that this type of screen occupies a niche, low-volume market. Keeping costs in check is the flat nature of the screen; those wanting super-widescreen and curved need to pony up even more cash. iiyama's styling is more functional than inspiring. The monitor has a black plastic surround - thicker on the bottom than the top - while the panel itself has a thin bezel. This is not an edge-to-edge screen, but the bezel's intrusiveness does little to get in the way of the viewing experience. Attaching the base couldn't be simpler. Part connected in the box, getting it up and running requires attaching three thumbscrews into the base. 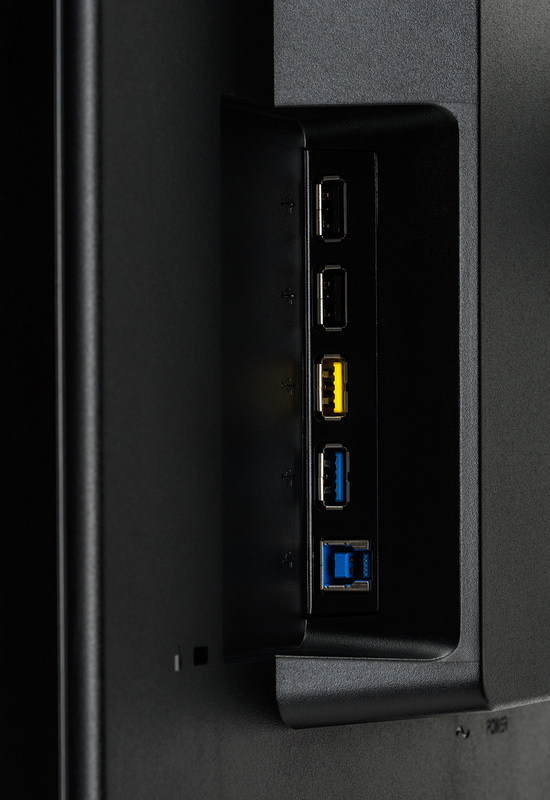 iiyama adds DisplayPort and HDMI cables, too, while power is built into the back of the screen, meaning a three-pin plug provides the juice. Measuring 827mm wide, a portrait orientation isn't supported. What you do get is 130mm of vertical adjustment on the stand, swivel of 45° in either direction, and 20° of backward tilt, so we found it easy to setup to our precise liking. The base provides a solid foundation for the screen; some cheaper widescreen monitors tend to move around a mite when typing hard on desk, but that's not the case here. Around back, the simple styling includes vents for the panel and a couple of 3W speakers that are best described as tinny - which monitor's aren't? A 100mm x 100mm Vesa mount is useful if you intend to hang it on a wall though the 220mm depth of the stand should pose no problems on any desk. It's all digital as far as inputs are concerned, with HDMI, HDMI/MHL, HDMI 2.0 and DisplayPort, and the latter duo are the only options if you want to run the monitor at its native resolution and 75Hz frequency. The matte panel is good at minimising reflections and uses AH-IPS technology so it has purportedly excellent viewing angles, good colour uniformity, though merely average brightness (320 cd/m²). For those interested, there's no gamer-specific technology such as FreeSync or G-Sync employed here, mind. 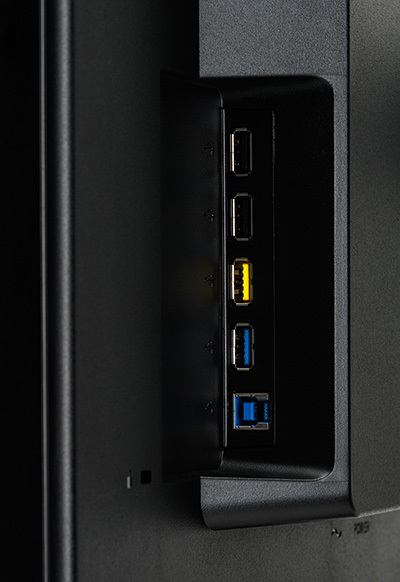 Peeking around the other side shows support for a USB 3.0 connector to the PC, two USB 3.0 ports, including a yellow-coloured 'fast charge', and a further two USB 2.0. The clean aesthetic on the front is helped by having five buttons facing downwards from the chassis. These control the on-screen display and, while perfectly serviceable, lack the pizazz and ease of use found on joystick-equipped models on some premium rival screens. Each button's function is marked on the chassis but it can be hard to see, so it's a case of trial and error until you're au fait with the system. Our review sample was connected via DisplayPort and we had to change the spec from 1.1 to 1.2 in the control panel to enable the higher refresh rates. Backed by a three-year warranty, let's now see how well it performs.